Do you remember a few years ago when I shared Novica with you? They're an amazing company that helps support people all around the world by selling their handmade items. The items available in their store make the most amazing gifts . . . even their wrapping paper is made by hand! 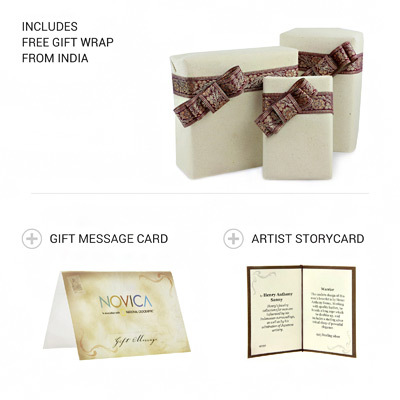 And one of the things I loved the most when I purchased from Novica before was how gorgeous even the wrapping and packaging was, so it's perfect for giving as Christmas presents. 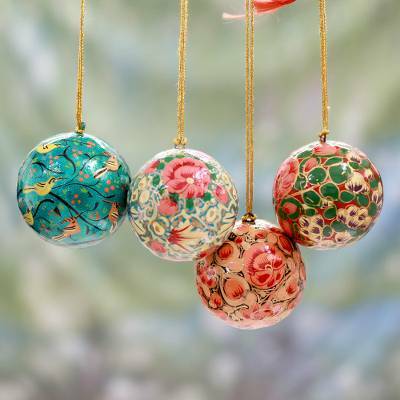 These gorgeous ornaments are made in India, and the set is just $22.95 right now! And they're paper mache which is perfect with the rowdy boys in my house. But they also have ceramic ones that let the light shine through when they're hung on the tree. If you want to splurge and buy a luxurious gift you wouldn't normally purchase, take a look at this jaw-dropping green and purple Kimono-style robe from Bali. I love how feminine the drape and pattern of the material is. You can also save $7 on your purchase with the code Save7Novica. Don't forget to sign up and use Ebates to get cash back when you shop online. They're currently offering 4% when you make purchases on Novica's site.